Library Cards are issued on site at the Circulation Desk upon completion of an application and presentation of identification with name and current address. Applicant must be present. Parents must sign the application for children under the age of 18. Residents, with a permanent address, of Alpena County are eligible for a free Library Card. 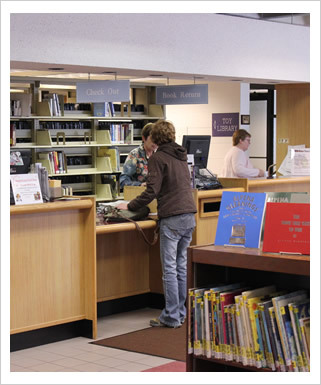 Residents outside of Alpena County can obtain a Library Card by paying an annual $25 Out of District fee. Residents without a permanent address may also receive a Library Card by paying an annual $25 Out of District fee. We require one of the following forms of identification as proof of residency. Both the parent/minor applicant must be present at the time of application. Borrowers with lost or stolen Library cards should report this to the Circulation Desk immediately to avoid possible misuse of the card. Borrowers with lost Library cards may obtain a replacement by applying in person at the Circulation Desk; there is a $1.00 fee for a new card, payable at issue. Identification showing name and current address is required. Borrowers who have forgotten their valid Library cards may have check out privileges with current identification. Library cards expire after one (1) year. Library cards must be renewed in person. Please visit the Circulation Desk to renew your library card. You will need to present a valid form of identification that includes your current address. When renewing a card for a child under the age of 18, the parent/guardian listed on the child's library account must show his/her current identification.